The only classical musician on Forbes' 2011 "30 Under 30" list of people changing the world, 19-year-old Chinese-American pianist Conrad Tao was found playing children's songs on the piano at 18 months of age. Born in Urbana, Illinois, he gave his first piano recital at age 4; four years later, he made his concerto debut performing Mozart's Piano Concerto in A Major, K. 414. In June of 2011, the White House Commission on Presidential Scholars and the Department of Education named Conrad a Presidential Scholar in the Arts, while the National Foundation for Advancement in the Arts awarded him a YoungArts gold medal in music. Later that year, Conrad was named a Gilmore Young Artist, an honor awarded every two years highlighting the most promising American pianists of the new generation. In May of 2012, he was awarded the prestigious Avery Fisher Career Grant. Sporting a truly international career, Conrad has appeared as soloist in the United States with the Philadelphia Orchestra, the Russian National Orchestra, and the Baltimore, Dallas, Detroit, and San Francisco Symphonies, among others. He has made multiple tours of Europe, giving solo recitals in Paris, London, Munich, Berlin, and Verbier, and performed with orchestras in Brazil, China, Hong Kong, Mexico, Moscow, and Singapore. Highlights of his 2012-2013 season include two more tours of Europe, including a concerto debut at the Concertgebouw in Amsterdam and a third reëngagement at the Louvre in Paris, appearances at the Mostly Mozart and Aspen Music Festivals, debuts with the National Arts Centre Orchestra in Canada and a return to Asia with the Hong Kong Philharmonic, and performances of all five Beethoven piano concertos in the United States. Conrad is an exclusive EMI recording artist. His first album, released as an iTunes exclusive in February of 2012 as part of the "Juilliard Sessions" series, comprised works by Debussy, Stravinsky, and Conrad himself. His second record VOYAGES, featuring compositions by Rachmaninoff, Ravel and Conrad's own, was released on June 11, 2013. You can download the album on iTune here. 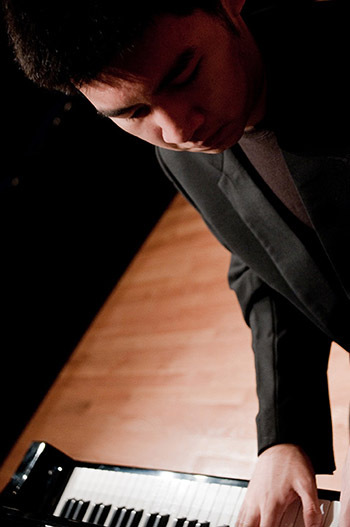 As an accomplished composer, Conrad has won eight consecutive ASCAP Morton Gould Young Composer Awards since 2004; he also received BMI's Carlos Surinach prize in 2005. For the 2012-2013 season, Conrad has been commissioned by the Hong Kong Philharmonic to write a concert overture ringing in their new season – frequent colleague Jaap von Zweden's inaugural season there as music director – as well as celebrating the region's annual China Day. He was also asked by the Dallas Symphony to compose a work observing the 50th anniversary of President John F. Kennedy's assassination, which will be performed in November of 2013. As an award-winning violinist, Conrad has performed with orchestras in Pennsylvania and Florida; in 2009, he gave nine performances of Mendelssohn's Violin Concerto in E minor (followed by Mendelssohn's Piano Concerto No. 1 in G minor in the second half) with the Symphony of the Americas in Boca Raton. Conrad's violin prowess was featured on Jackie Evancho's Dream With Me PBS special, on which Conrad also traded spots with David Foster behind the piano. Conrad currently attends the Columbia University/Juilliard School joint degree program and studies piano with Professors Yoheved Kaplinsky and Choong Mo Kang at Juilliard. He studies composition with Professor Christopher Theofanidis of Yale University, and studied violin with Ms. Catherine Cho for five years at Juilliard's Pre-College Division.